Tadoku graded readers have been published by the following three companies. 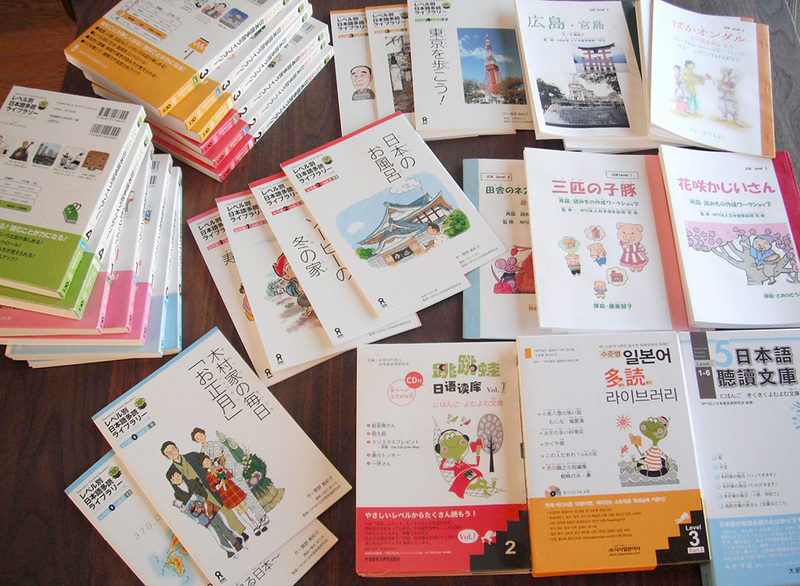 These readers were especially written for Tadoku with controlled grammar and vocabulary, and illustrations are effectively used in order to give visual clues to Japanese words. Kanji characters are reasonably used even in the level 0 text to maintain authenticity of the text, but furigana is given on all kanji characters. Currently 15 volumes covering levels 0 to 4 are available. Each volume contains 5 to 6 booklets with an audio CD. Currently 8 volumes covering levels 0 to 5 are available. Each volume contains 4 to 7 booklets. Majority of the booklets in this series are reprints of the previously published by NPO Tagengo Tadoku (see below). MP3 audio files are available via links on the publisher’s web pages. Published by NPO Tagengo Tadoku. These 9 booklets covering level 0 to 3 are not re-issued by Taishūkan Shoten, and are still available from NPO Tagengo Tadoku. Downloadable MP3 audio files are also available. You may wish to enlarge your Tadoku collection with Japanese children and popular books. Here are links to lists of Tadoku books with difficulty levels already assessed by the NPO and libraries. Book from Japan – Children & YA: A section from this annotated bibliography site covers literature works for children and young adults which were selected by juvenile literature specialists. 絵本ナビ (text in Japanese): A book review site of Japanese children’s books. Many titles have allow the site visitors to preview 4 to 6 pages of the books. You need to assess the difficulty of a non-graded Japanese children or pupular book when you add it into your Tadoku collection. Here are links to useful reference documents for level assessment. These documents were provided at a Tadoku workship held at University of Southern California, October 3-4, 2015.